Have you entered NRC Taxis Olympics Competition? Have you entered the NRC Taxis Olympics competition? Enter and you could win a €50 One 4 All voucher! Just guess how many medals Team Ireland will win and like and share the Facebook post and you could win a €50 One 4 all voucher! Competition closes on Sunday midnight so not long to go now! With some disappointment so far – there’s still a good chance that we’ll bring home a few medals – but how many?! The Donovan brothers are looking good in the Rowing so there could be a medal there! Also looking good are the for sailing champion Annalise Murphy, show jumper Greg Broderick may also be in with a chance. We also have Claire Lambe and Sinead Lynch into the women’s lightweight double sculls final and you can’t forget about golfer Padraic Harrington and our London hero Katie Taylor. With just over a week to go and with plenty more action from Team Ireland – you never know where the medals will come from! So post your guess on the NRC Facebook page and you could be €50 richer by the end of the Olympics! With three HD projectors and 14 ultra HD TV’s to watch all sporting events, it’s the perfect spot to watch the EUROs. Also serving food and worth checking out their special food deals! This bar is right between Temple Bar and Georges Street so can’t get more central than that! The River Bar on Burgh Quay right beside O’Connell Street is a fantastic sports bar offering up sports on stunning high definition TV screens! With all the sports channels you won’t miss a second of the EUROs. And ask about the special food deals also! With one of the biggest screens for live sport in Dublin as well as many 60″ HD ready Plasma TVs The Living Room is the place to watch the EUROs! And with their fab beer garden – you can stay here all day and night! According to Murrays they boast Europe’s only 2 stunning 3d big screens so worth checking out! It gets crowded so get there early! Head to Sinnots Bar on South King Street to watch all the sports you ever wanted. With 14 large screens throughout the Bar with a state of the art audio visual system – it’s the place to watch sports! Right beside St Stephens Green this is a busy spot at the weekend so get there early if you want a seat! Located on Nassau Street at the bottom of Grafton Street with access off Adam Court. Porterhouse Central Dublin is seriously long and with huge screens – what more do you want?! Enjoy a pint and watch the EUROs in the spectacular setting of the Church Cafe Bar! Order your favourite tipple or sample their award winning food and relax in the Church Bar! D2, one of Dublin’s leading sports bars can broadcast all sporting matches over 20 screens not to mention their monster 20ft screen located in the Beer Garden. So you can watch the match while enjoying the sunshine! The Bridge 1859 is owned by popular Dublin publican Noel Anderson and Irish Rugby royalty Rob and Dave Kearney, Jamie Heaslip and Sean O’Brien so you’ll never miss a rugby match in this bar! A great sporting pub on Dublin’s southisde. What makes the Goat extra special is the wonderful food, the family atmosphere and the service. The Bleeding Horse have TVs outside so as you can sit with a drink in the summer shade, watch the match, talk to your smoking friends and not have to worry about being inside. Quality spot with loud commentary and solid bar food. This is a real sports bar with loads of TVs, huge screens, jugs of beer and the mixed nationality crowd means an incredible atmosphere. The highlight has to be the terraced seating but it gets super busy so get here early. NRC Taxis now have the facility to provide a chauffeur driver service for that special occasion at competitive and affordable prices. With uniformed, professional and experienced drivers you can rely on NRC Chauffeur Driver Services for a punctual, friendly and safe journey. Our fleet includes of the most up-to-date luxury saloons, MPVs and mini-coaches. For a pleasant, relaxed and secure experience call NRC Chauffeur Drivers today on 01 677 2222. 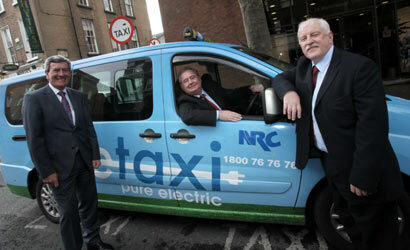 Have you tried the NRC Taxi APP?! The NRC Taxi app allows you to book a taxi with just a few taps on your phone! The NRC Taxi App which is just as easy as other taxi apps but you have the added knowledge of booking with a reliable local Dublin firm.